Reguengos de Monsaraz (Portugal) (AFP) - Facing a shortage of Roman Catholic priests, women churchgoers have stepped in to lead Sunday services in villages in southeastern Portugal, a sign the ageing communities are open to change. 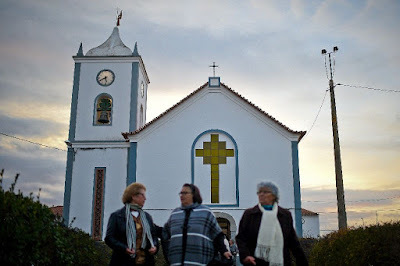 In the tiny church of Carrapatelo, a village overlooking the vineyards of the Reguengos de Monsaraz region, Claudia Rocha stands before a dozen mostly elderly female churchgoers wearing a black dress and sneakers. 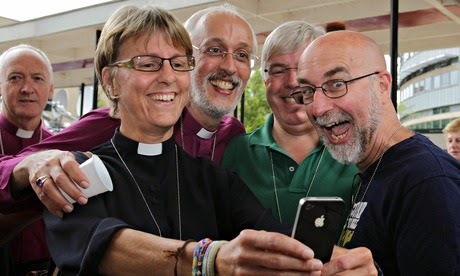 Her leather jacket and smartphone sit on the front-row bench as the 31-year-old leads what the church terms "Sunday Celebrations in the Absence of a Priest" with ease. After prayers and church hymns, she makes comments on the day's biblical reading, a form of preaching. At the end, Rocha hands out communion wafers representing the body of Christ that were blessed by the priest beforehand, but wine is not part of the ceremony. "This church would be closed if I wasn't here. Who cares if I am a woman, a deacon or a priest? What matters is having someone from the community who maintains our connection with the priest, even when he isn't here," she tells AFP. 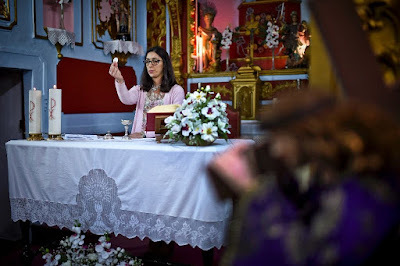 A divorced social worker without children, she is one of 16 laypeople -- eight men and eight women -- chosen by Father Manuel Jose Marques to help ensure regular attendance at the seven parishes he presides over. "It might seem strange and new, but we haven't invented anything here. It's a tool that has long been set out in the Church's guidelines, for cases when it's absolutely necessary," says the 57-year-old priest. 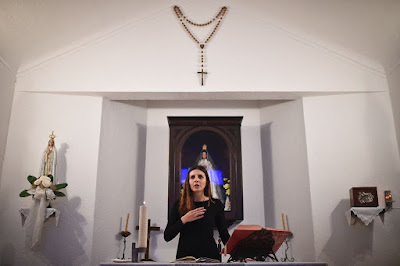 The practice of Sunday services being led by laypeople in a priest's absence take place in a number of countries, including Canada, France, Germany, the Netherlands, Portugal, Switzerland and the US. It began in the 1980s, when services were prepared with a priest or ordained clergy member, resembling mass but without the rite of consecrating bread for communion or the Eucharistic prayer. The Vatican and many clergy members have refused to encourage the practice, fearing a trivialisation of the tradition of Mass. Father Manuel had no such misgivings. To him, the need to set up Sunday services without a priest became apparent as soon as he took on his seven parishes around 16 years ago. Before, there had been three priests for the seven parishes in Reguengos de Monsaraz, a town in the region of Alentejo between Evora and the Spanish border. He assembled a group of 16 volunteers aged between 24 and 65 from varied backgrounds. "These are people who have experience with faith and welcoming Christ, and who know how to talk about it," he says, noting he makes no distinction between men and women. Lay women step in, too, in other rural parts of Portugal, whose population of 10 million is overwhelmingly Catholic but only counts around 3,500 priests for 4,400 congregations. Last August, Pope Francis set up a group to study the role of women deacons in the early days of Christianity. While he ruled out the possibility of ordaining female priests, the move was considered a potentially historic opening towards a place for women in the Church. "It is a very sensitive subject, but what we have done is very simple. In this tiny village, we are quite a bit ahead of the Vatican," says Rocha. The progressive Father Manuel says he believes "women would be very good priests and deacons" but is quick to add: "It's not the opinion of one priest, or even 10 that makes theology." "We are living in the heart of an open community, the difference between men and women is no longer as strong as it was in the past," says Dora Cruz, who teaches catechism in Campinho, a village of 700 people. "But women's equality doesn't necessarily come from priesthood," adds the 31-year-old mother and kindergarten teacher. Members of the congregation approve of having a woman behind the altar. "People found it strange at first -- a woman leading Mass? But now we're used to it," says Angelica Vital, a 78-year-old pensioner. "If we're short of priests, I think they should be allowed to marry -- they are men, like any other!" she adds, with a devilish grin. Number one: Spirituality. The systems of spiritual design on your planet are starting to change. This is not telling you that certain ones are going to go away. They're simply going to change. Some of the largest spiritual systems, which you would call organized religion on the planet, are shifting. They're going to shift away from that which is authority on the outside to authority on the inside. It will eventually be a different way of worship, slowly changing the rules while keeping the basic doctrine the same. The doctrine of the Christ has always been to find the God inside. The teachings were clear. The examples of the miracles were given as an example of what humans could do, not to set a man up for worship as a God. So when that has been absorbed, the teaching of the Christ can remain the teaching of the Christ. It simply changes the interpretation. The teachings of the great prophets of the Middle East (all related to each other) are about unity and love. So once the holy words are redefined with new wisdom, the Human changes, not the words of the prophets. In fact, the prophets become even more divinely inspired and their wisdom becomes even more profound.